The average American spends over 4 hours a day on their phones, making an employee mobile app the easiest and most effective way to reach your people. If you haven’t yet deployed an employee mobile app, you’re missing out. Engaging a workforce starts with communication, and employee mobile apps are proving to be the most effective way to improve engagement at scale. Who owns an Employee Engagement App, Human Resources or IT? How is an employee engagement app different to an Intranet? What should you be looking for in an employee engagement app? Successful organisations understand that in order to hit goals, they have to work together as a team. Whether you’re 10 or 100,000 people, every one of your employees need to be aligned. A clear internal communications strategy is key to engaging your workforce. As is a the use of a consistent and user-friendly tool that enables internal communications to reach everyone. 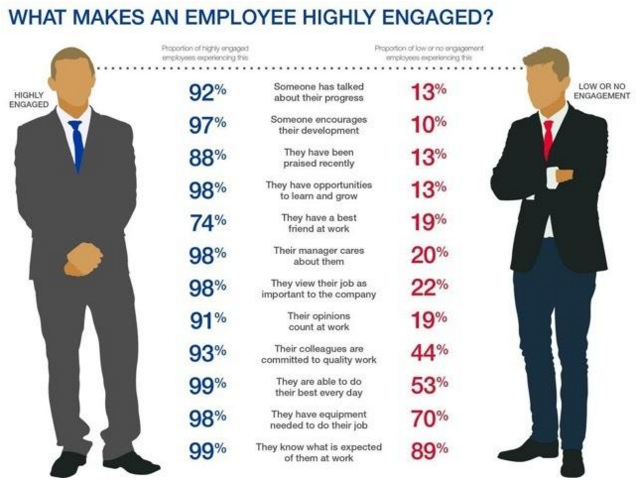 65% of employees are disengaged at work. Feeling valued is the foundation for great engagement. We feel valued when we are listed to, when we are informed of the company's goals, and when we’re enabled with the right tools. Only then do we feel engaged at work. One reason why mobile employee apps consistently return greater engagement levels than intranets is their familiar, personalised behaviour. The intranet requires the individual to have a reason to visit it. Often it’ll only work well on a desktop and often only from within your physical office. Communication is most effective when consumed at the right time. For Internal Comms this might be when your people are on the bus, have some downtime at lunch or when waiting in a queue at the post office. All the times we currently spend on our phones! Mobile apps have personalised push notifications so users are proactively notified about relevant content. The information is delivered natively to a mobile device which is where your employees can always be found. Effective internal communication is a cornerstone of any successful employee communication plan. At Blink, we often find the need for an employee engagement app is first identified by an employee engagement survey. This forms a tangible benchmark for a business case, that we can baseline improvements against and build the Return on Investment model. Typically our ROI models include; retention, employee satisfaction, productivity and alignment with corporate goals. We measure these through a mixture of existing HR metrics and via the employee engagement survey, which is typically repeated within 6 months of the Blink rollout being completed. We always see a significant improvement in the level of engagement, especially with frontline workers. Of course, the key goal is often to improve customer satisfaction. Luckily a 2012 study showed the correlation between customer and employee satisfaction is stronger than the correlation between ibuprofen and pain relief! The bottom line is that this must be a human centered project, with the needs of the employee at its heart. An employee app should be a central part of an effective employee engagement strategy. The business case for the investment should be owned and championed by HR, in partnership with the business and IT. But this is not just another IT project. How is an employee engagement app different from an Intranet? An employee engagement app is feed based. Personalised feeds, with interactive cards, just like social media. An employee engagement app is mobile-first. Not an Intranet website ported to mobile - everyone can see right through that! Of course, your employee app should also work on desktop, with native desktop and tablet apps. Your app integrates with other enterprise systems. This means your work approvals, notifications, updates all appear in one place for a truly digital workplace. The difference in the above is easy to measure. In one recent Blink deployment, the Intranet was used by 27% of the workforce, on average 3 times per month. Now, 88% of the workforce open Blink weekly, and 81% open Blink every day. "Internal Communication with a small i". At Blink this is the term we use for Internal Comms that is created within the organisation, by team leaders, champions, project heads and frontline workers. Your mobile app must allow Internal Comms to come from anywhere in the organisation and fizzle up. Don't even think about a top-down Internal Comms App. Connect to your existing tools. To make your app relevant to your audience, it must be directly relevant to their job roles. This means connecting to existing workplace apps and pulling relevant updates into the feed. This isn’t enterprise social; this is productivity first. Open to everyone. Don’t even think about hiding your employee app behind a Mobile Device Management tool. You want your frontline workers to install your app on their personal phones, so don’t make it too hard from them! Work without email. Similar to above, your app shouldn’t require a workplace email address. Blink works with mobile phone numbers, using SMS invites and special ‘magic links’ for one-click onboarding. Blink is the next generation mobile intranet, with push notifications and a personalised work feed to help deliver your internal communications strategy. Blink is an award winning employee engagement mobile app, built around a personalised work feed which delivers updates as cards directly to employee mobile phones to be actioned and swiped away. It also features group messaging and file storage which complement the feed and make Blink the one super app for work comms. Traditionally all these features would have been bolt-ons to your intranet. But that doesn’t deliver the experience your people now expect. With the Blink employee engagement app, the experience is much slicker, so you get a better reach and higher engagement. Blinks feed is familiar, easily digested and always available even off network so your workforce can engage with your internal comms. People use their downtime, breaks and commute to stay informed connected and enabled with Blink. The Feed can also be configured to work with your existing apps, which can automatically post their actions into the feed for employees to deal with. This reduces app fatigue and removes the need to context switch. Once you try a mobile employee app like Blink, you’ll never look back. Blink is not an intranet but it does do all the things your intranet used to, and more. Try it out today. Enter your email address here to get started.